Anxiety is a feeling of unease, such as worry or fear, and is a natural human response to an unfamiliar or scary situation. Normally, the feeling serves to help the mind feel more focused or motivated, and it later subsides after the event. With some people, however, this anxious feeling is a constant part of their daily lives, sometimes even leading to anxiety attacks. This is indicative of an anxiety disorder. Anxiety disorders affect around 40 million American adults every year, with women being more at risk than men. They are caused by a complex interplay of genetic, hormonal, and external factors, and often accompany other psychological and physical illnesses. The periodic anxiety attacks endured by some people can be very disruptive to daily life. Keep reading for more information about anxiety attacks and how to recognize them. An anxiety attack, also known as a panic attack, is defined as an abrupt onset of intense fear that reaches a peak within a few minutes. They often occur suddenly and for no apparent reason, with the symptoms often mimicking a heart attack or a breathing disorder. This leads many people to admit themselves to the emergency room under the impression they have a life-threatening condition. For this reason, anxiety can be difficult to diagnose, causing frustration for those who experience it. 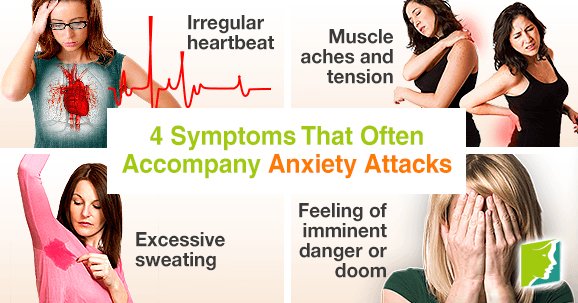 A range of physical and psychological symptoms generally accompany anxiety attacks, some of which are outlined below. An anxiety attack triggers a rush of adrenaline in your body, which means a sudden increase in heart rate and blood flow. "Fight or flight" mode naturally causes the muscles to contract. As this state is only supposed to last for short periods of time, being chronically anxious can be harmful to physical health. With muscles that are continuously responding to anxiety, the prolonged contraction can lead to muscle tension and pains. Sweating occurs to help cool the body down from the energy generated by the increased heart rate and blood flow that accompany anxiety attacks. Sweating is also a natural response to stress or nervousness. Anxiety causes feelings of danger or doom and a rush of adrenaline. This is then compounded by frightening physical symptoms, which can feel like suffocation or a heart attack, leading to understandable psychological suffering and fear. Anxiety attacks can be terrifying, especially for someone who has never experienced one before. It can be difficult to understand the violent physical reactions your body is having. In some people, they can occur randomly or with no obvious trigger. Therefore, it is important to recognize the symptoms and talk to your doctor about ways to reduce anxiety. For more information on anxiety and how to treat it, follow the links below.